I have learned to be wary when the mainstream press describes an artist as “progressive” – you never know what they really mean, since the vast majority of progressive music is almost certainly unknown to the writer. Cobra High is a case in point. I first heard of them when a local Seattle paper profiled them, comparing them with Yes (but without the pretense, of course). What “progressive” means in this case would seem to be arrangements slightly more complicated than your average alternative band (changing tempo in the middle of a song, oh my! ), and keyboards that do something other than play block chords or arpeggios. They have much in common with some of the post-rock movement, though still tied to easily recognized songs rather than breaking free like Sigur Rós or Don Caballero. Whether by design or accident, they have hit on a nice combination of elements, though I find many of the keyboard sounds on the ordinary side. 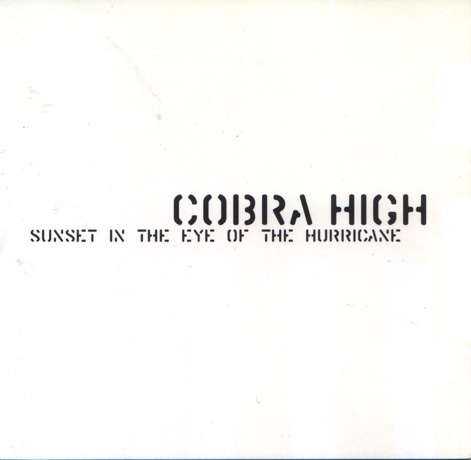 The guitar parts are what makes Cobra High interesting. Instead of power chords or strumming, there are repeating patterns somewhat like King Crimson. They seem to be playing at the edge of their abilities, with occasional awkward transitions or faltering tempo. The main problem with this debut is the quality of the sound: it is muddy throughout, with the drums muffled, the bass indistinct, and the guitars glossed over with reverb when they should jump out clearly. Nice demos, guys – can’t wait for the real album. Ole Lukkoye rides the "Good Waves"